So today I heard the Story of the Chicken. I have a friend, an amazing young woman in her last year of college who shared it on Facebook, and that chicken is what I’ve thought about much of today. Apparently this poor chicken fell off of a “chicken truck,” and my friend and her friends saw it. When questioned about the fate of the chicken, she shared that the bus driver for their apartment area was going to come back and get the fallen bird. The bus driver has a farm. This chicken is on her way to be a pet. Oh bless. That makes my heart so happy! I’ve thought about that poor chicken and how she must have figured, riding on that truck, that the worst had pretty much happened and her fate was sealed. Then, as if things couldn’t get any worse, she falls off that truck. Which wound up being a wonderful turning point in her life instead of the great tragedy it could have been. Thanks to the kind soul of the bus driver. I do this, do you? I ride along thinking things are really bad and then something happens and I think OH NO COULD THIS GET ANY WORSE? and it turns out that, no actually, what I thought was going to be even worse is really quite wonderful. Not always. But enough times that I find myself having hope even in the hardest of situations, when it just makes no sense. Sometimes we’re the chicken, y’all–in a real predicament. But sometimes, we get the opportunity to be the bus driver. And when we do, we should take it. We really, really should. The bus drivers of the world, the ones willing to take another in and give them comfort–they are the folks who are chasing the darkness into a corner with a big ol’ broom and making this world a much better place. One little soul at a time. The day my Aunt and I found ourselves in a parking garage was a day of rain and slick roads and hard things and laughter and stories and all the good things of being with someone you love and adore can be, despite what the Universe has going on around you. Because, in case I haven’t mentioned it, I do love and adore her. As we pulled into the garage, intent on parking and getting to our destination and reason for the nearly three hour trip, I began the descent (yes descent–interesting setup in that one) on the first deck. I was remembering other times in parking garages maybe or maybe I was finally relaxing after driving through some heavy rain, not exactly sure of the route. Whatever the reason, I kind of zoned out. (Kind of nothing–I was in another world.) I remember looking to my left and thinking it curious that I was still seeing an outside view even though we had circled down a couple of floors and should have been underground already. After making three complete circles of floors and not seeing a single parking space, my Aunt gently interrupted whatever was going on in my brain. With her help I finally figured out how to go down a level and then another. It was on the third level below that we found the perfect spot. One easily pulled into and out of, with plenty of space around it–excellent and desirable qualities in a parking garage parking space. I’m pretty sure we laughed the whole way to the elevator that led back up to ground level. I’m thankful for my Aunt for so many reasons, but right now I’m thankful for her gentle prompting to keep me from continuing to go around in circles. Because if she hadn’t y’all, I’d still be there right now. Circling around. Wondering how come no spots were opening up. In this life we have those moments, don’t we? All of us. When we get our wheels stuck. Or we circle around and around, never really advancing or getting anywhere, unable to move forward. Isn’t it nice when we have folks who love us enough to gently call us out on it, and then laugh with us when we wonder what on earth we had been thinking? If you have one of those folks, give ’em a hug. If you are one of those wonderful people who help the rest of us keep on keeping on, thank you. Here’s a hug from me. We need you in our lives, with your caring ways and gentle reminders of how to move forward. Thank you. Tonight at Evening Prayer we were talking about strangers. In the middle of listening to the story of Abraham and Sarah greeting a stranger and the story of the men on the road to Emmaus coming upon a stranger, one thing came to mind. 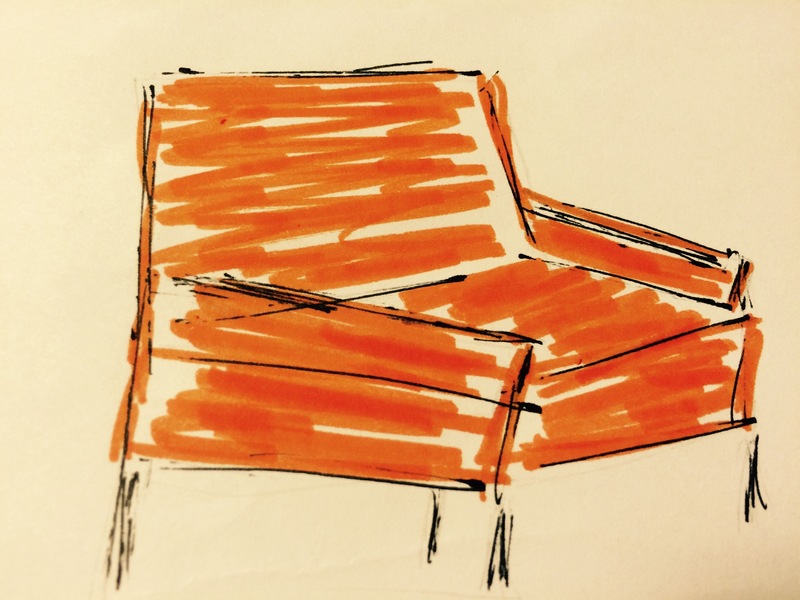 My rendition of our orange chair. It was given away years ago. In our little five-room house on Boy Scout Road that we lived in from when I was not quite three until I was nine (when we had six people living there and my parents decided enough was enough), we had an orange chair. Perhaps I should explain this was back in the 70’s. Orange was the old black back then. It sat by the door to the little hall in the center of the house. The one where the space heater sat. The chair was upholstered in a lovely fabric. I’m sure it wasn’t silk but it had a neat feel to it. It was built all square and quite comfortable. One rainy (Sunday?) night, we heard something outside. The edges of this memory are hazy, but I know I was very young. I remember the open door revealing a dark night, with the exception of the street light, and the rain pouring down. And the young man who was coming into our house. We didn’t know him. Only that there’d been an accident. Right in front of our house. He had been riding his motorcycle and what with the rain, he’d laid it down right about the time a station wagon was coming from the other direction. I don’t remember there being anyone there at that time besides him, and I don’t think it was a hit and run either. I guess the station wagon wasn’t involved in the accident, but it was a part of the story. Mama led him to sit in the orange chair. He was pretty shaken up. And hurt. I remember a bustle of activity. Mama went to nursing school before she started college, so she knew the basic things to do for him. Or maybe that was just her Mama know-how kicking in. I think she or Daddy must have called for an ambulance because I vaguely remember others coming in, and I don’t remember Daddy leaving to drive him anywhere. What I remember most is him sitting in the chair. And I remember what I saw after he left. Over the years the chair had one or another “chair cover” thrown over it. I guess it was because of those little blood stains. Or because it was orange. Maybe a little bit of both. We had some fancy ones–ones with fringe and that foam backing so it didn’t slide. Tonight when I remembered that chair, I realized that was the first time I remember seeing my parents help out someone they didn’t know. Giving. Caring. But it wasn’t the last time. Not at all. And the lesson stuck. When it comes to someone in need, there is no such thing as a stranger. When someone is hurt or lost or broken or hungry, you sit them down in an orange chair and you do what you can with what you have to change their circumstances. For the better. May we all have the opportunity and heart to welcome a stranger this week. Today the Zoo Crew and I were busy preparing for an evening of mischief and merriment. We pulled out some of our Christmas treasures and our Princess was happily putting them throughout the house. It was fun watching her plan where she wanted to put what, and I only naysayed her twice. Once on my Granny’s Santa, which I wanted to grace my back porch this year and second, a pillow that belonged to my Mama. Everything else I let stay where it was. She was happy, and so was I.
I was in the kitchen working when I heard her talking to Cooter in the other room. She was trying to get him to assist her in putting up some decorations. He was lounging on the floor with a book, and she was flitting all over, putting Christmas lovelies in different places. Oh law, where was this headed? I leaned toward the doorway to hear better. He muttered something that sounded faintly like no. “Well, it is H. E. L. P. Help. Have you ever heard of that?” She sounded fed up. But this Mama was quite relieved. As far as “h” words go, that’s a good one. I don’t know what Cooter said back, but his sister asked him didn’t he want to help her and he said no. Now while I am glad she is beginning to get it, I can reassure you this hypothesis of hers is still in its experimental stages, or else she would be doing it more. Since it makes her feel so good and all. Actually, she has gotten better at seeing what needs doing and–okay, truth, she’s getting better at responding when I ask her to do something. She dusted today. That, my friends, was huge. Y’all know how I feel about dusting. Tonight I’m thankful that the “h” word, according to our Princess, is “help.” When she first started spelling it I wasn’t sure what conversation I was about to have to have with her. I give thanks for her willing and cheerful hands today–from dusting to caring for Miss Sophie to vacuuming and helping at the grocery store, she was my right hand girl today, and I appreciate her and her cheerful spirit so much. I’m also glad she feels good when she helps. That is a beautiful thing, and I hope she always feels that way. And it reminds me of something that I often forget–helping others makes folks feel good–so maybe the next time someone asks if they can help…..
maybe I should just share some joy and say yes. Too often we try to carry our burdens and tasks and life all by ourselves. As Princess reminded me today, we don’t have to do it alone. If we let others help us, it just might bless them too. Yeah. I need to work on that one. Whether you are helping another or letting them help you, I hope your day is full of the “h” word and all the good feelings that come along with it. They say you should make that your goal each day, you know? So today I did it, and that makes me glad. Doesn’t happen every day, so it’s kind of a big deal. Today Leroy and my Fella were hanging some shades for me. It was no small task, and I am thankful they were willing to take it on together. But that’s nothing new; I already knew that one. That one came in handy big time with this project. We almost made a really big mistake. It’s a good thing to remember–like “righty tighty, lefty Lucy.” I use that phrase a lot–especially when I’m outside turning on the water spigot. I love little memory tricks like that. 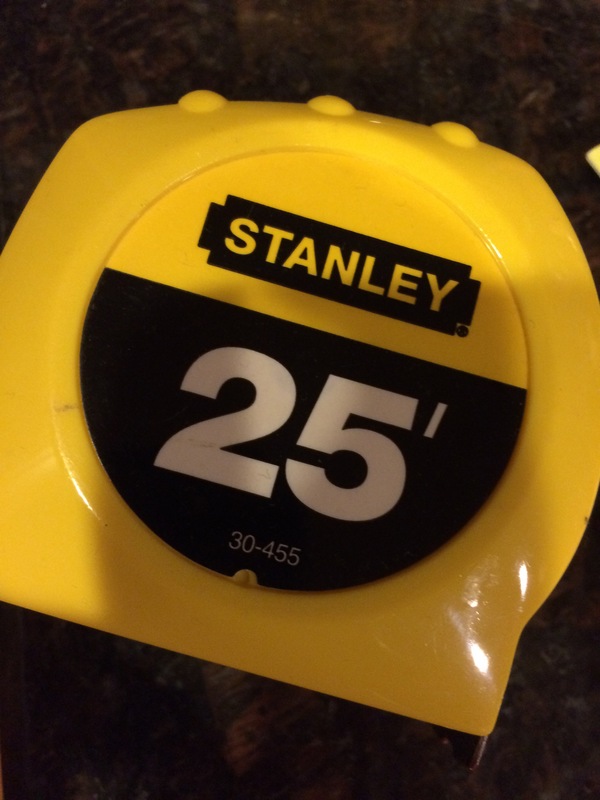 But it was when the project hit a snag today that I learned a new and important part of home improvement projects. Leroy and the Fella were putting their heads together over what would be the best next step to take. The Fella mentioned our local hardware store not far from here, and Leroy’s face lit up. “Yeah, I’ve been wanting to go in there.” They were both smiling at this point. It was pretty close to precious. “You know, it’s not a real home project until you have to make at least one trip to the hardware store,” Leroy told me. Really? No, I didn’t know. Again, good to know. Duly noted. Tonight I’m thankful for windows with shades and for the two guys who made that happen. Isn’t it awesome that we all have different gifts and talents and that we can share those to help others around us? I give thanks for a job well done and for lessons learned in the midst of it. All other lessons aside, Leroy taught me once again about the gift of grace. He set out to do the job, but his game plan allowed for grace. Grace when all the necessary tools weren’t in place, and grace for when there was a mistake. He didn’t beat himself or anyone else up and make the whole experience even more difficult than it already was. He had built-in grace. We need something we don’t have? No worries, we can go see what they have at the hardware store that can work. A slip of the hand and there’s a cut and blood? No problem, clean it up, slap on a band-aid, and let’s finish this job. I love it. Today my brother-in-law and my Fella taught me that even in home projects, in the words of my Bubba, “It’s never that serious.” It’s all about getting it done. Doing the best we can with what we have and keeping our wits about us. Working with others and helping folks out. With smiles on our faces and grace in our hearts. Kind of sounds like a good way to go about life too, doesn’t it?